Grand Canyon University freshmen rugby players Ethan Hall, Darien Pickett, Kris Sheckels, Joshua Ransom and Austin LaGow became friends at an all-star football camp in the eighth grade. As five of the best football players in Virginia, they each decided to attend West Potomac High in Alexandria – a city six miles south of Washington – to help create a “football dynasty.” Injuries derailed their freshman season, so LaGow and Pickett, who grew up playing rugby, helped start the Fort Hunt Warriors, a rugby club team associated with their high school. They won a state championship as sophomores and encouraged Ransom, Sheckels and Hall to join the team their junior year. 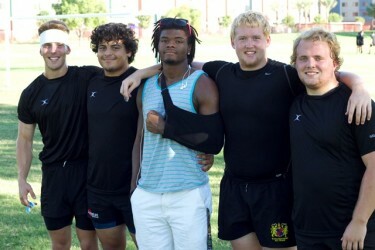 GCU rugby coach Ryan Kelly brought in five rugby stars from Virgina to lead the team in it’s first year in Division I. From left to right: Ethan Hall, Darien Pickett, Joshua Ransom, Kris Sheckels and Austin LaGow. Ransom, who dislocated his shoulder, hopes to return by the spring season. After advancing to three consecutive state playoff appearances and winning a second state championship last year, Pickett, Sheckels and Ransom wanted to play rugby together in college. 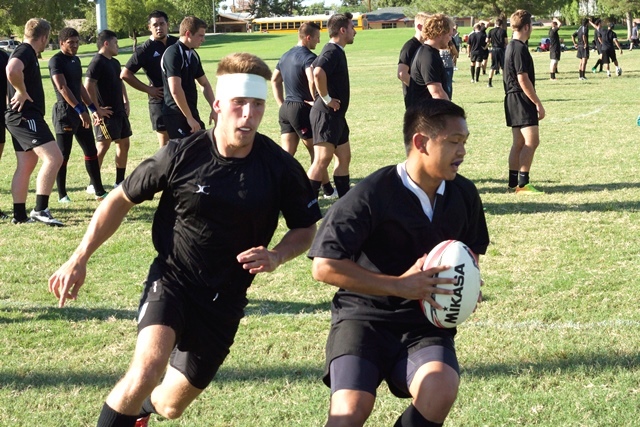 The trio met GCU rugby coach Ryan Kelly at last summer’s all-star camp and committed to GCU. The three standouts hoped to bring the same “dynasty” they created in eighth grade to GCU and approached LaGow, a rugby Stars and Stripes All-American, and Hall, who missed being an All-American due to injury, to join the team. Pickett, 18, a two-time All-American, played with the Team USA under-19 national team in England and Argentina. He said the quintet chose GCU because of the Christian environment and West Coast location. The five stars from Virginia will play key roles as GCU’s rugby team takes on some of the nation’s best programs in its first year as an NCAA Division I club sport. They join a roster of 49 players, most freshmen or sophomores, including fellow freshman All-American teammates Nick Kwasniewski and Andrew Fraczek. The rugby program began last semester, when the University brought in Kelly, a former Phoenix Rugby Club coach and the first player from Arizona to earn USA Rugby Collegiate All-America honors, to launch the club program. Kelly held an open tryout and signed 21 students to the team. They practiced in 7s and played an exhibition game against Arizona State University last spring. Kelly was allowed to recruit 28 players over the summer to fill a roster of 49 athletes. Most players receive academic financial support, as club teams aren’t given athletic scholarships. Hall (left) helped lead the Fort Hunt Warriors to a state championship as a senior. He said GCU’s squad has the most talent of any team he’s played for. Hall, a justice studies major, served as captain of the Fort Hunt Warriors squad along with Pickett, Ransom and Sheckels. He said Kelly brought in other skilled players to create a more competitive roster. The Lopes will play their first official game, a 7s contest vs. nationally-ranked ASU at Tempe Diablo Stadium at 8 p.m. Tuesday. They will compete in 7s and 15s in the spring against many teams ranked in the top five in the nation, including the University of Arizona and UCLA. GCU assistant coach Merrick Firestone said having the five guys from Virginia allowed the university to put together a more difficult schedule. “Having them on the team allows us to be competitive with the top 20 schools in the country,” said Firestone, who played rugby with Kelly at Arizona and also coached for the Phoenix Rugby Club. “Without quality guys like them, we wouldn’t have been able to schedule the schools we play this year,” he said. For more information on GCU rugby and a full schedule of games, visit the rugby team website at gcuruby.com.